Samson was raised in Oakland starting at the age of six years old. 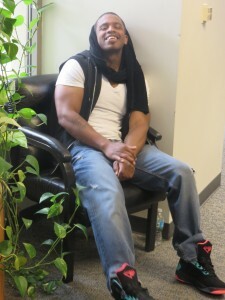 By the age of 14 he was living the street life and started going in and out of Juvenile Hall and group homes. When he turned 18 he continued down the wrong path, making bad choices that ultimately perpetuated the cycle of going in and out of prison and “catching” strikes. In 2009, Samson was released from jail, and he was ready to turn his life around, but after returning to his neighborhood he was pulled back into engaging in illegal activities. Finally in 2011, after a stroke of luck prevented him from being incarcerated for a long sentence, he knew it was time to change his ways. Once he committed to change his life Samson focused on taking the right steps to be successful. Then good things started to happen for him. He received his apartment. He looked for steady employment. It was not easy. Samson said, “I was still struggling, but I wasn’t waking up in no cell.” Samson was working hard to get his life together. Then Samson was referred to Oakland’s Ceasefire by a friend. 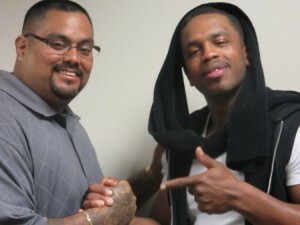 He met with Oakland Unite’s Lead Case Manager, Emilio Mena, and was then connected with his personal case manager, Javier Jimenez. In his words, his relationship with Emilio and Javier is deep, “They are special friends of mine, basically family members. I can call them in the middle of the night, they are there for me at court,” Samson said. Samson has succeeded in turning his life around with hard work, determination, and the support of his case manager. He has a full-time job that pays him weekly and provides benefits and a retirement plan. Samson is working with The Mentoring Center and taking parenting classes. He is focusing on being a better worker and reuniting with his son. In the future he would like to continue working and open a group home. He had many negative experiences when he was in and out of group homes as a youth so he wants his group home to be different. Instead of being based on punishment, his group home will be run with rewards. Clients will be rewarded for “handling their business” instead of being put down for not doing it. Once other clients see their peers getting rewarded Samson is confident they will change their ways and be motivated by the rewards. Samson is a good example of the importance of this work. With the right type of intensive case management services and wrap-around support, lives can be transformed. Samson is now a contributing member of our Oakland community. Oakland Unite would like to recognize Samson for his hard work, determination, and dedication.